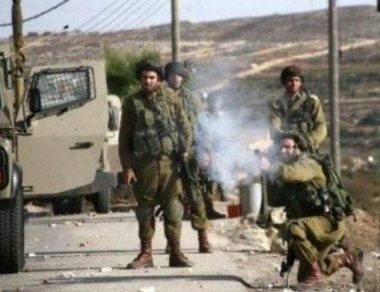 Israeli soldiers shot, Friday, a young Palestinian man in Teqoua’ town, east of Bethlehem, in the occupied West Bank. Medical sources said the soldiers shot the young man with a live round in his knee, before he was rushed to a local hospital. The Palestinian was shot after several army jeeps invaded the town, and attacked Palestinian protesters with live fire, rubber-coated steel bullets and gas bombs.